We just love mason jars. They are just so incredibly versatile and always look good. They look good stuffed with pretty much anything: food, flowers, utensils, pencil crayons, craft supplies etc. They also make the most adorable gift sets! Mason jars are really inexpensive and you can even find them at dollar stores. Tip! Adding a pretty piece of fabric, ribbon and gift tag makes the gift set extra cute! Feel Better Gift Set. Not only does this mason jar set look super adorable, it will also make you into the world's greatest friend! Seriously, how thoughtful is this gift? So simple but so sweet. This one was made for someone fighting a bad cold and in desperate need for a little TLC. Fill one jar with anything cold/flu related and the other jar with some homemade soup. We made a hearty lentil soup but any soup will do. If you prefer, you can create a dry layered soup recipe instead. Just remember to include the instructions on the label. Baking Gift Set. 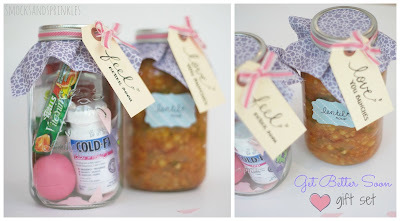 Great for a house warming or bridal shower gift. Fill one jar with baking essentials or decorative items and the other with the layered ingredients for a baked good recipe. Layered cookie recipe, muffin/bread recipe etc. Who doesn't love high tea? Help someone recreate the high tea experience in their own home. 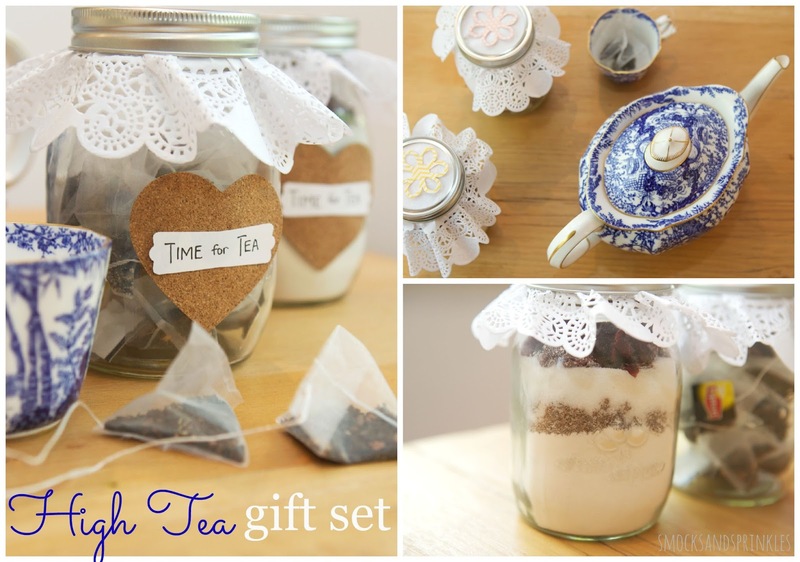 Fill one jar with different types of tea accessories and one jar layered with the ingredients for a scone recipe. 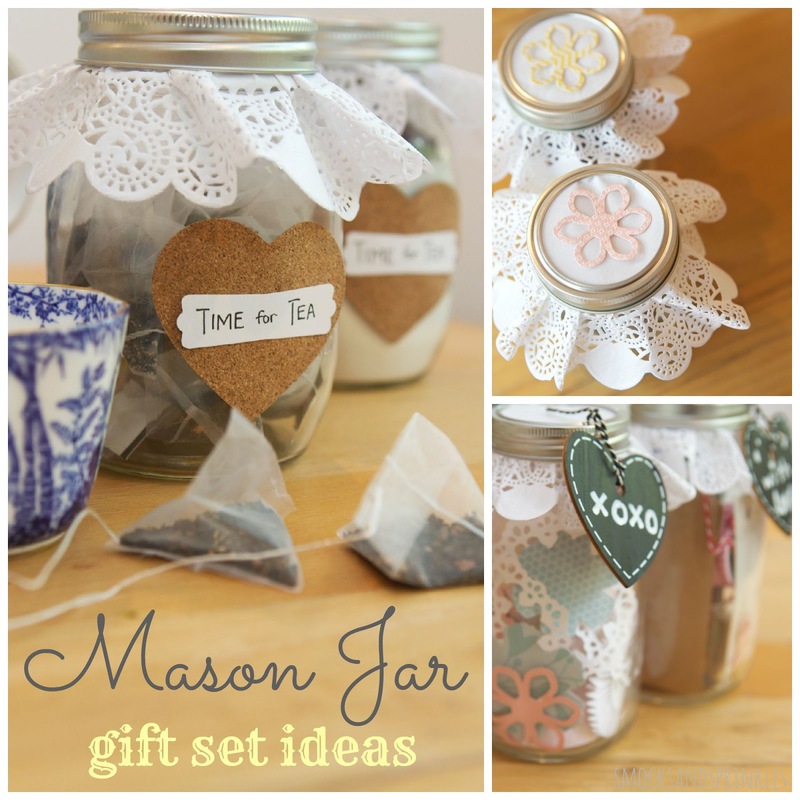 You can also include a jar of their favourite flavour of jam/jelly, or include a cute teacup/teapot with the mason jars. Labour Gift Set. This is perfect for all your mama-to-be pals out there. Great gift idea for a baby shower too! 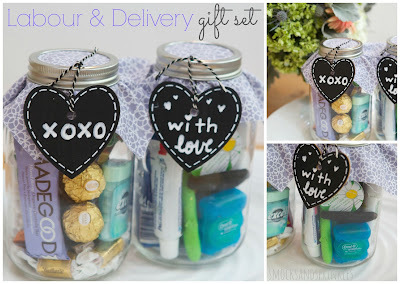 Fill one jar with labour essentials and another jar with their favourite snacks. Add in a straw so they can use the mason jar as a drinking glass. 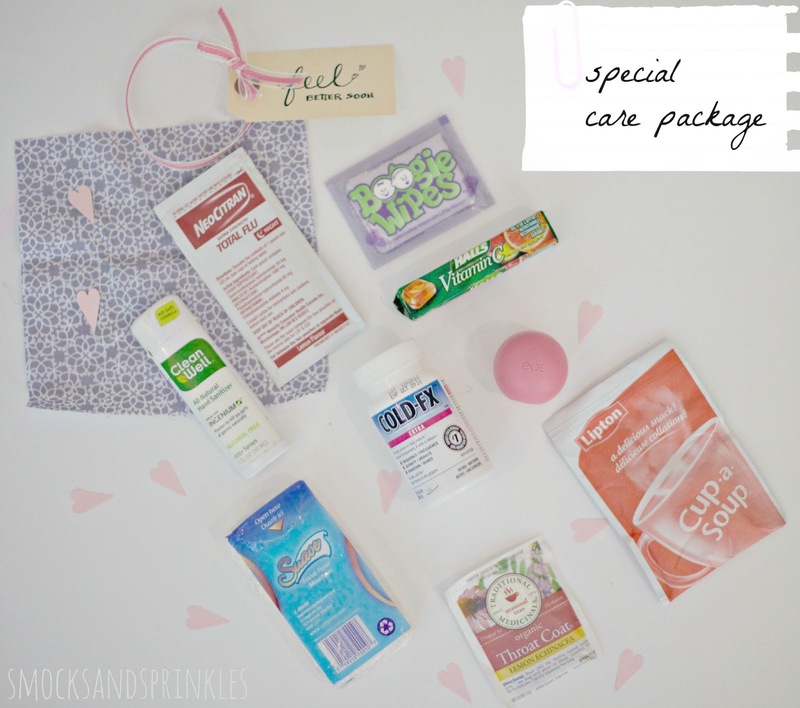 Newborn Survival Gift Set. Fill one jar with anything that can help a new mom, and another with essentials for a newborn. Gift cards for a take-out restaurant, diaper service etc. Baby Bath Gift Set. 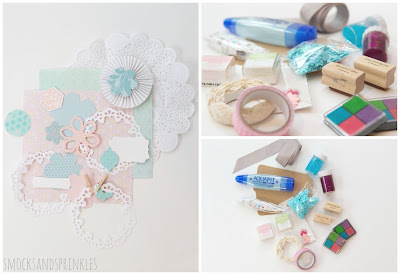 Another great idea for a baby shower gift or a newborn. Fill one jar with baby bath essentials and the other with colourful washcloths (this would look really pretty layered or you can roll the towels up into little balls and secure with a rubber band). I Love You Gift Set. Perfect for Valentine's Day, a birthday or just because! Fill one jar with little notes stating all the different reasons you adore and love the person. Take some time to reminisce and write down memorable moments that stand out in your mind. Fill the other with their favourite things...snacks, candy, gum, gift cards, lip balm etc. You can even print out photos in a cute, small size to mix in with the notes! 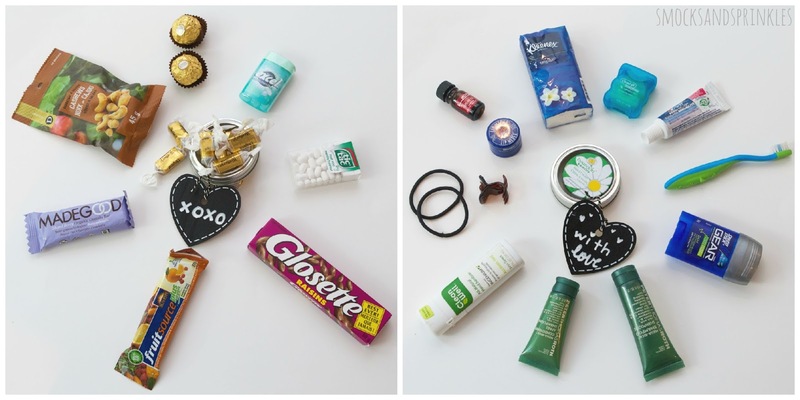 Your significant other's favourite things! Travel Gift Set. For all your travel-obsessed friends (wherever they are, I am jealous). Fill one jar with travel essentials and the other jar with their favourite packaged snacks (in case they feel like munching on something on or between flights). 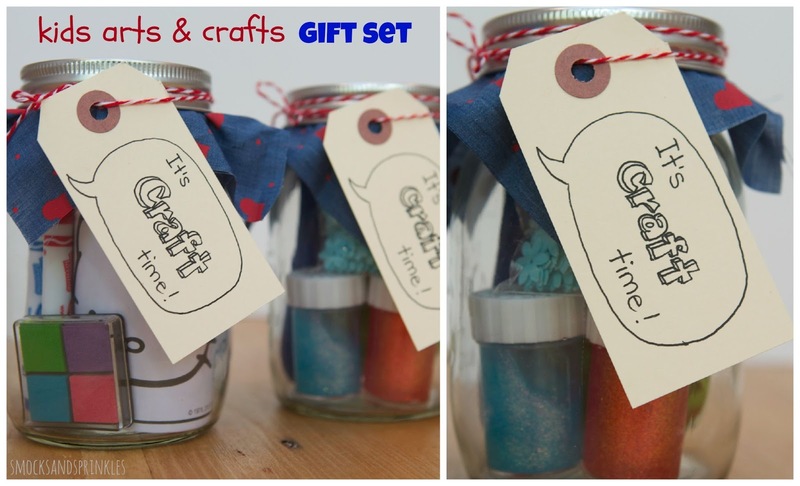 Crafty Gift Set. For all your artiste friends! Fill one with some small paintbrushes and paint. The mason jar becomes the perfect water container for painting on the go! 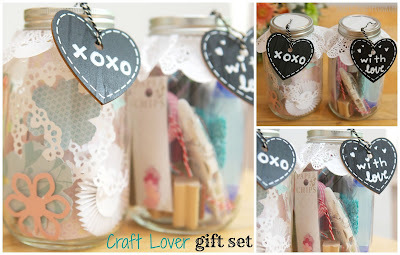 You can make different jars for different types of crafts: Paper crafting, knitting/crocheting, sewing. The possibilities are endless! 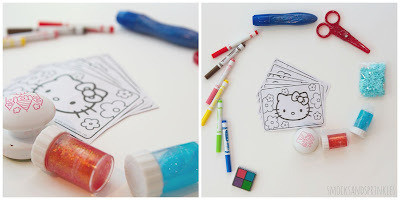 You can also easily create a kids arts and crafts kid set with any kid-friendly art materials. Beauty items: lip gloss, perfume rollerball, etc. Sporty Gift Set. Fill the jars with sport memorabilia and the other one with sports equipment. Ping pong balls, badminton birdies, darts, etc. Tip! Use any of these ideas, but pack it in a different container to suit your occasion! You could put the travel gift set in a cute travel toiletry bag, or the high tea gift set in a teapot! The sky is the limit! 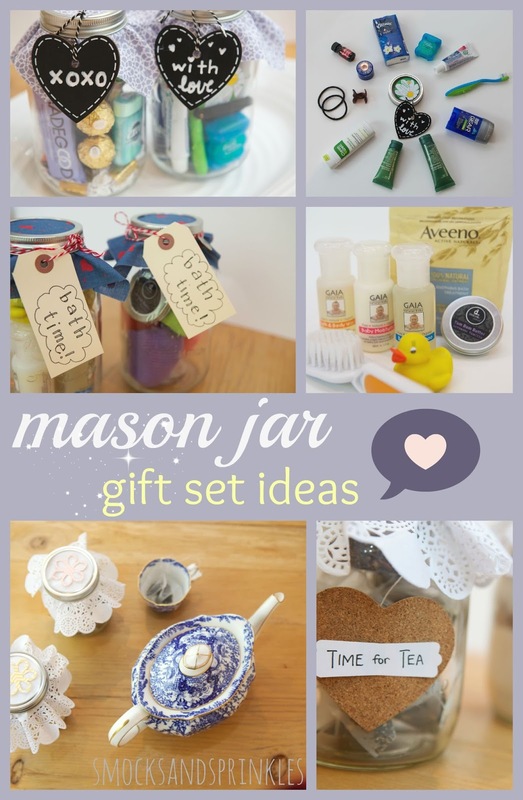 You can pretty much come up with a mason jar gift set for any occasion. Please let us know if you come up with your own unique gift set. Happy mason-jarring!